Cardiff beat Blackburn in the semi final of the FA Cup in 1925. The match was played at Nott's County's ground and the Bluebirds won 3 - 1. The final ended in disappointment for City though with a 0 - 1 defeat against Sheffield Utd. During that cup run City beat Darlington in round 3 after a second replay which was played at Anfield. In round 4 City beat Fulham at Ninian Park and then in round 5 there was victory away against Notts County. City beat Leicester at Ninian Park in round 6 to earn the match against Blackburn in the semi final. 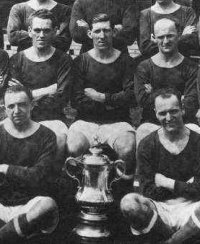 Of course 2 years later in 1927 City managed to go one better and actually win the FA Cup. Blackburn themsleves then won the last of their 6 FA Cups in 1928. Previously they had won the Cup 5 times in 8 seasons between 1884 and 1891. Their last major success was the League Cup in 2002 when current boss Mark Hughes played in a 2 - 1 win over Spurs at the Millennium Stadium in Cardiff. The last time the teams me in the FA Cup was in the 1957 / 58 season. The teams were drawn together for a 5th round tie at Ninian Park. That match finished 0 - 0 so 5 days later on Thursday 20th February 1958 City went to Ewood Park but lost 2 - 1. That was the last FA Cup meeting, in the league the teams have not met since April 1985 when Blackburn won 2 - 1 at Ninian Park to complete a league double. Cardiff City v Blackburn Rovers.